You, as an IAVM member, are our most important asset. Without your commitment to the association and to the venue management industry, we wouldn’t be here. Because of your support, we are featuring member profiles in our I Am Venue Management series. If you are interested in participating in the I Am Venue Management series, please visit http://www.iavm.org/i-am-venue-management-share-your-story. If I wasn’t doing this I’d be a: part of another sector of the hospitality or beverage industry. Most impressive person I’ve ever met is: Ray Charles. He was genuinely warm and engaging with our crew, staff, and students. At the same time, he had a keen business sense. He demanded excellence and professionalism from everyone on his tour and always gave the audience his very best. I unwind by: spending time on the water with family and friends. On my desk right now is: a few industry publications, my MacBook Pro, and some photos of my wife and daughter. My favorite IAVM program I ever attended was: Venue Management School, class of 1999. If I were on the other side of the seats, I’d be: an artist manager or producer. One trait an up-and-coming venue manager should have is: the ability to maintain perspective in a chaotic situation. One up-and-coming venue star in the arena industry is: my friend, Al Karosas, at the Bryce Jordan Center at Penn State. He’s never afraid to try something new to make his venue better. One of my goals for this year is to: help foster more transparency between the work of the IAVM Board of Directors and our members. How do you plan to help elevate the profession? Work to provide meaningful experiences in venue management for young people interested in the industry. Where do you see new growth opportunities in the profession? Strategic use of social media, the next generation of guest experience initiatives, and more seamless collaboration with the artists and teams that play our venues are all areas where we can continue to innovate. How do you stay current with industry trends and developments? Visit other venues, read the various industry blogs and publications, and check in with friends and colleagues throughout the industry. Who are three people you’d invite to a dinner party and why? Peter Drucker, my favorite management guru; Walt Disney, one of the true architects of guest experience; and Dave Chappelle, because what dinner party wouldn’t be more interesting with Dave Chappelle? 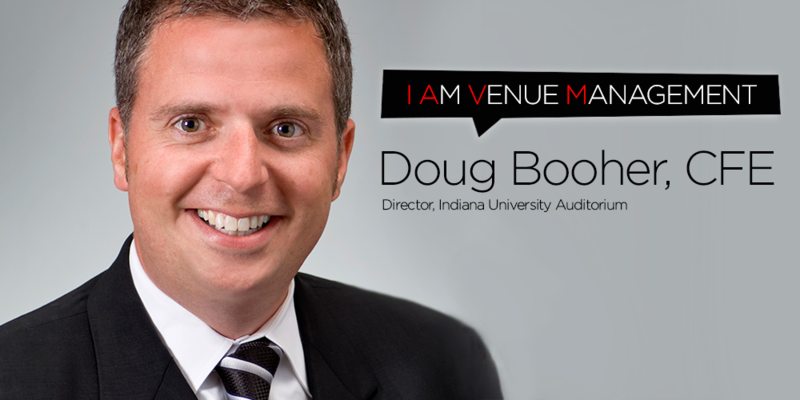 Doug Booher, CFE, is the director of Indiana University Auditorium and the 2016-2017 first vice chair of the IAVM Board of Directors.